Congratulations to violinist Itzhak Perlman, who will receive the Presidential Medal of Freedom, the United States' highest civilian honor, in a Nov. 24 ceremony at the White House. 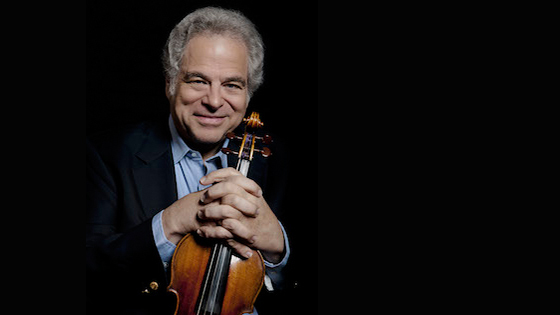 Perlman’s medal citation says that "Itzhak Perlman is a treasured violinist, conductor and sought-after teacher. Among his many achievements are four Emmy Awards, 16 Grammy Awards, and the 2008 Grammy Lifetime Achievement Award. He was awarded a in 2000 and a Kennedy Center Honor in 2003. A native of Israel, he came to the United States at a young age and was introduced to Americans broadly when he appeared on the Ed Sullivan Show in 1958. Mr. Perlman made his Carnegie Hall debut in 1963 when he was 18. In addition to performing internationally and recording the classical music for which he is best known, Perlman has also played jazz, including an album made with jazz pianist Oscar Peterson. Perlman has been the soloist for a number of film scores such as Schindler's List, which subsequently won an Academy Award for Best Original Score. Alongside his wife Toby, Mr. Perlman teaches talented young musicians through the Perlman Music Program. Through his advocacy and his example, he has been an important voice on behalf of persons with disabilities." Click here for a complete list of the 17 recipients of this year's Presidential Medal of Freedom, which also includes Barbra Streisand, James Taylor, Steven Spielberg, Stephen Sondheim, Gloria Estefan and Emilio Estefan. Itzhak Perlman: Complete Recordings On Deutsche Grammophon, a set of 25 CDs from 1968 to 2001 which includes his Berg/Stravinsky Concerto recording with Ozawa; Elgar Concerto with Barenboim; and recordings of the Saint-Saëns, Wieniawski, Lalo, and Vivaldi “The Four Seasons” concertos. It also includes a recording of Bach Arias with Kathleen Battle and Perlman conducting Ilya Gringolts in the Tchaikovsky and Shostakovich Concertos. Itzhak Perlman - The Complete Warner Recordings (77CD), which reunites Perlman's EMI and Teldec recordings made over a period of more than 30 years, including violins concertos as well as Perlman’s commissions from living composers, Perlman’s own commissions from living composers, crossover repertoire such as jazz, ragtime and klezmer, and more. Recently I heard an older recording on the radio of Perlman playing the Tchaikovsky Concerto. For someone my age, Perlman's recordings pointed the way, gave us something to aspire to. These recordings and live performances are a product of their time, and times and tastes have changed. But Perlman created enduring and beautiful moments in time (still does!). Here he plays the Tchaikovsky with Eugene Ormandy and the Philadelphia Orchestra.